1. 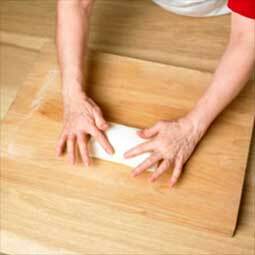 For best results when rolling out puff pastry use a large, clean dry area of the work surface and lightly dust it with plain flour. 2. 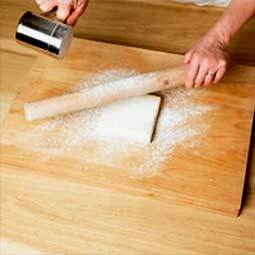 Place pastry dough on surface and lightly dust it and the rolling pin with flour. 3. 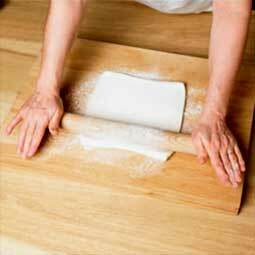 Roll pastry firmly, always rolling away from you, give the dough two to three rolls. 4. 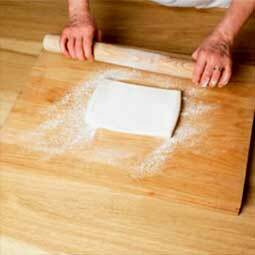 Then turn the dough a quarter turn. 7. 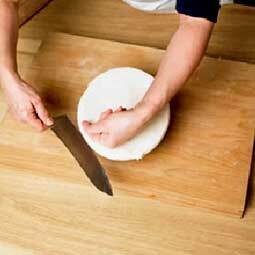 Lift the pin with the pastry around it carefully and turn it to lay out and continue rolling. 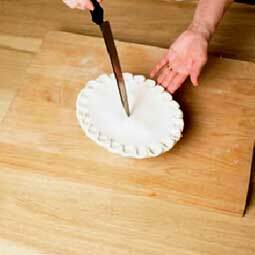 Again this is done to prevent the pastry from stretching as you lift it which in turn would result in shrinkage in baking. 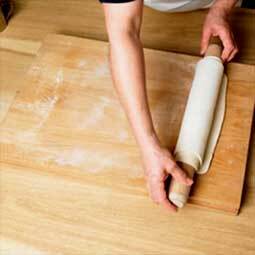 Puff pastry should be rolled out to approx. 4mm to 5mm depth. 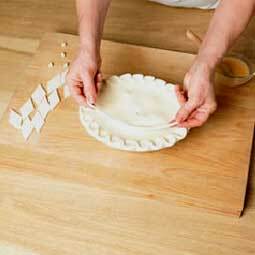 Add a touch of flair to pies, jalousies and other pastry dishes by being imaginative with the decoration on top. 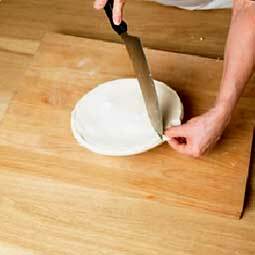 For best results when making a pie with a pastry top or lid, choose a dish with a rim and allow the filling to get completely cold before topping with the pastry. 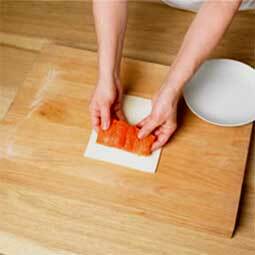 Roll out pastry large enough to cover the dish and with some to spare.. Cut a strip, slightly wide than the dish rim, from the sides of the rolled pastry. 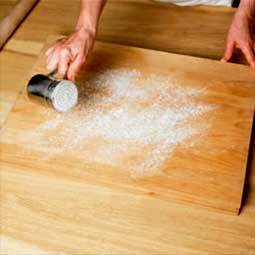 Brush rim with water or beaten egg. 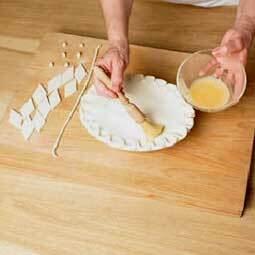 Place pastry strip on rim and press firmly down, continue with further strips until all the rim is covered. Brush pastry with beaten egg or water. 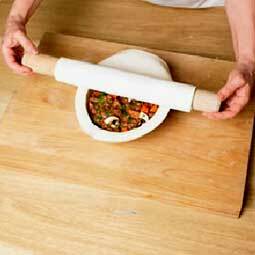 Roll pastry up on the rolling pin to lift (as described above) and gently unroll it over the pie dish. 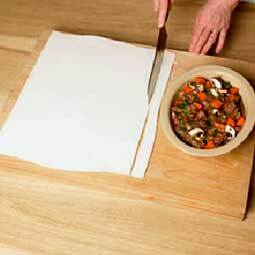 Press pastry edges firmly all round. 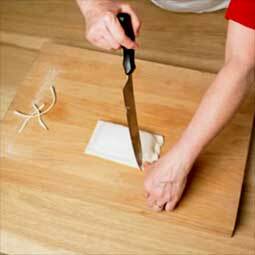 Make a fluted edge by pressing the thumb of your left hand firmly down on the top of the pastry on the opposite side of the dish from you, whilst drawing the back of a knife inwards, against your thumb as shown. 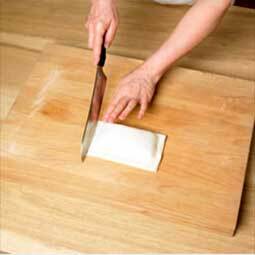 Continue until all the edge is fluted. 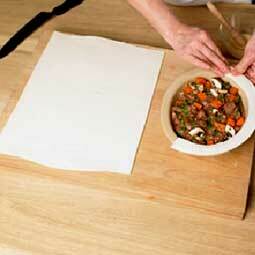 Make a small hole in the centre of the lid to allow the steam to escape. 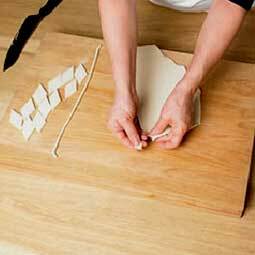 Re-roll trimmings and cut out several strips of pastry. 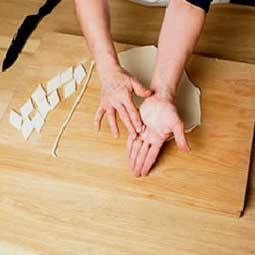 Holding the knife at an angle, cut the strips diagonally to give diamond shapes. 11. 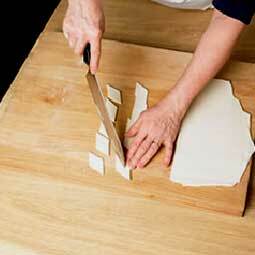 With the point of the knife mark veins on the pastry 'leaves'. 12. 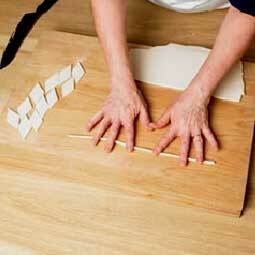 To make a 'stalk' cut further slightly narrower strips and roll them beneath your opened hands to form long cylinders. 13. Finally, make 'berries' by gently pinching off a small piece of pastry. 14. Then roll it around the palm of your hand with the fingers of the other hand to form small balls/berries. 15. 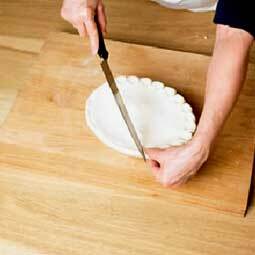 Brush the pie top with beaten egg. 16. Lay the leaves, stalks and berries on in your chosen pattern and press gently onto lid. 17. Brush again before baking. En Croute describes the wrapping of a filling such as steak, salmon, chicken etc in puff pastry and sealing it well to make for a moistly cooked filling encased in crisp, golden pastry. 1. 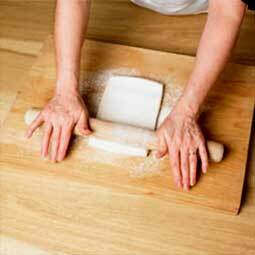 Roll out the puff pastry as described in the pages 'Rolling out Puff Pastry', and cut into the desired size as stated in the recipe. 2. 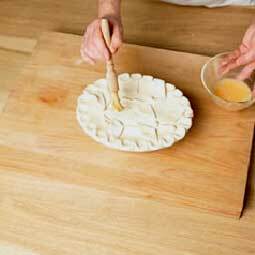 Lay the filling on one half of the pastry - leaving a good border all round. 3. 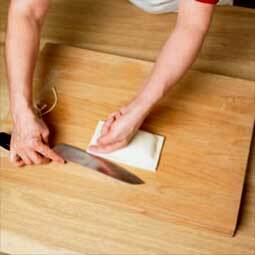 Brush the pastry edges lightly with beaten egg - note -do not use too much egg as this will make it difficult to seal. 4. 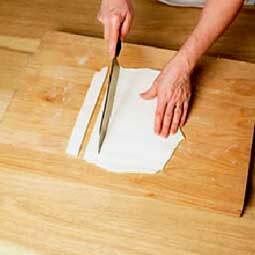 Bring up the uncovered half of the pastry and fold it over the filling. 5. 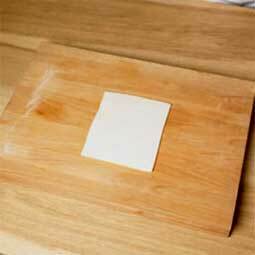 Press edges firmly together. 6. 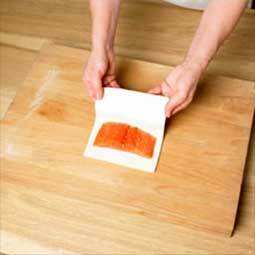 With a sharp knife trim off the edges to allow for a good rise. 7. 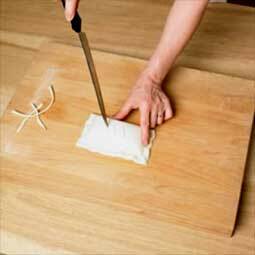 Then knock up the edges by holding the knife horizontally and taping it gently against the cut edges. 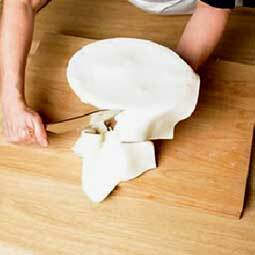 This again helps to both seal the pastry and gives a good, risen edge. 8. 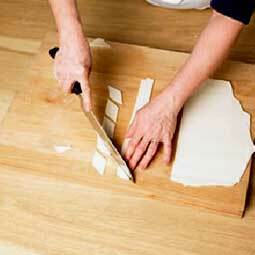 Flute the cut edges of the en croute as described in the Puff Pie tops and decorating section (see above). 9. 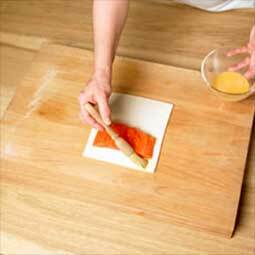 Make a couple of slashes or slits in the top pastry to allow the steam to escape and brush the top with beaten egg before baking. This article comes from Jus-Rol which offers an exciting and convenient range of ready-made pastry products. The Jus-Rol story dates back to the days when convenience foods were a rarity and luxury food items were almost non-existent. It started in the 1930s, in Coldstream, Northumberland when a family man named Tom Forsyth opened his own bakery business. Little did he know then, that after surviving the war and the great depression, that his business would lead him to become the founder of the UKs pioneering pastry company, Jus-Rol. 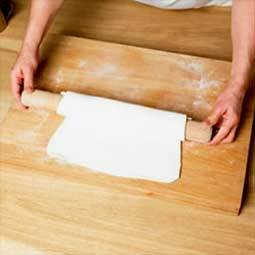 In the early 1950s Tom began selling puff pastry to his bakery customers and Just-Roll was soon in regular demand. The locals loved his puff pastry and it was within no time at all that his pastry rose not only to be popular for its great taste and quality but above all, convenience. Tom soon realised that there was an opportunity to produce the product for a wider audience and so he struck while the iron was hot and began trading nationally in 1954.